Customer research is an important factor in generating business revenues, so it must be done right. Customer research is an important factor in generating business revenues, so it must be done right—that is, at the right place and at the right time. The online medium should not be the only way of gathering customer information. Recognizing emerging trends—behavioral, demographic and emotional—helps companies move forward strategically. A brand should exude confidence; it should reflect what it’s selling; it should express the true essence of what it offers to its audience. A brand is like a persona with a clear function to perform. You build a brand according to what is and what should be. People look to this persona—read brand—to identify and recognize its worth among many others. It is always focused, persistent, persevering toward an intention, and aims to win it all. Looking at the online world, a brand’s aims are ownership and recognition. A brand used to be merely a symbol to help people recognize and differentiate it among its competitors. But today, a brand does more. It’s a positive force in driving marketing and profits. It is the power that pushes a company to greater heights. Conducting customer research online…lets you gain knowledge and understand your customers better. Conducting customer research online is an effective approach that lets you gain knowledge and understand your customers better. If you’re doing it online, get it right. How Should a Brand Sell Itself? identification—Are customers able to identify with the brand? 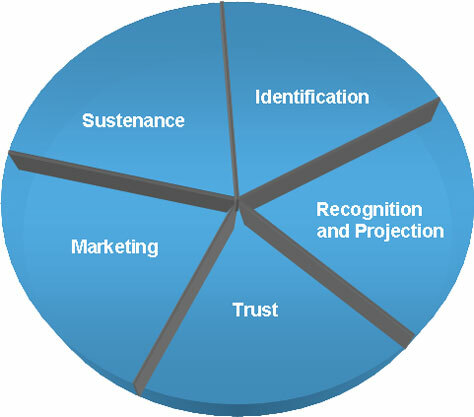 recognition and projection—Is the brand able to deliver recognition, recall, and awareness? trust—Are customers able to trust and value the brand? marketing—Is the brand able to project itself through the various channels available? sustenance—Is the brand able to sustain itself within the competitive marketplace? marketing from a customer’s perspective—Customers, or users, expect a Web site to sell them what they want. This means a brand needs to sell both itself and what the company offers to its audience. Target your market and ensure that they get what they are looking for. marketing from a business perspective—When you create a brand, collect customer information and gather feedback that, in turn, lets you create a database for use in further promotional purposes. For example, social networking services can also gather information about their customers through other services like Orkut. Through Orkut, five years down the line, Google will know you better than your best friend does. Some of the status-casting providers like Twitter also do this well. And email services display contextual advertisements based on the keywords in your messages. The more blatantly you ask prospects and customers for information, the more hesitant they’ll be to continue using your service and become loyal customers. The Web is an effective customer research channel, because you can do customer research online in the most subtle ways. The more blatantly you ask prospects and customers for information, the more hesitant they’ll be to continue using your service and become loyal customers. You might overlook a major persona, because a particular segment of customers does not use the Web. The validity of the data you collect can be uncertain. Hunting customers down on the Web infringes on people’s privacy. Throwing questions at customers at the wrong time could lead to frustration that might overwhelm them. People can easily fake their responses and emotions online. 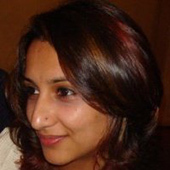 It’s very difficult to convince people to engage in online research activities. How Are Companies Doing Customer Research on the Web Today? Let’s look at current practice for customer research on the Web. 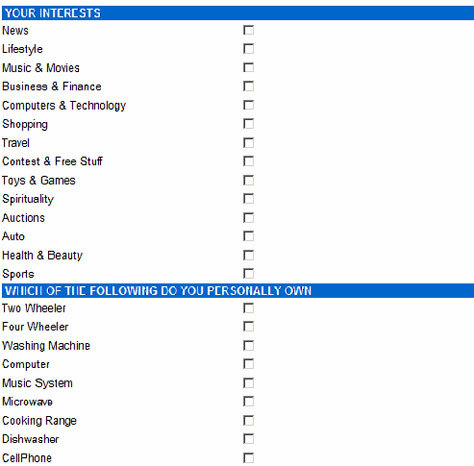 Some Web sites get customer research right and others don’t. 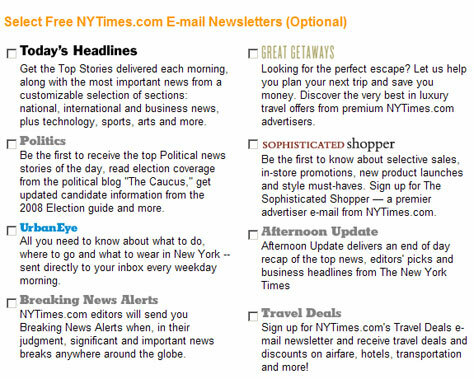 The New York Times cross sells its newsletters well during their registration process, as shown in Figure 2. This helps prospects grasp what the Web site is selling, while enabling the company to obtain customers’ email addresses. This clever technique is both less intrusive and more engaging. Dove engages customers through a quiz, which makes the interaction less obtrusive. Thus, they’re able to sell their ad campaigns as they gather information online. Figure 3 shows the Dove quiz. 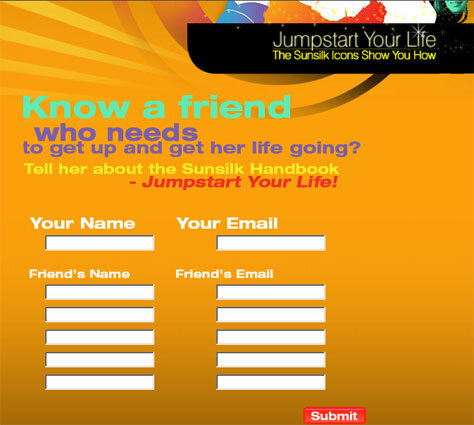 As shown in Figure 4, Sunsilk does a good job of using an online expert to gather customer information. Customers can ask questions about a specific topic, and the expert answers them online. This effective technique encourages customers to provide their personal information in return for the information they receive. Sunsilk connects emotionally with customers by involving their friends and family. This is an excellent approach. Many other brands just ask for personal information without establishing any emotional connection with their audience. Have a look at their tagline in Figure 5. It’s a perfect fit for this brand’s audience. 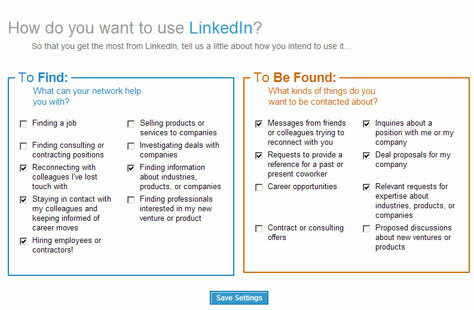 The well-known social network LinkedIn uses a clever behavioral technique that lets them get to know their customers over a long period of time. This Web application builds customer relationships by tracking their online behavior, as shown in Figure 6. 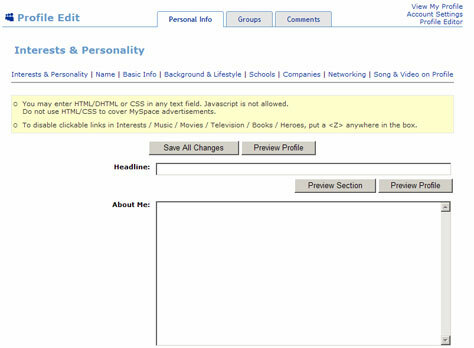 Fox Interactive Media strategically engages in getting to know their customers through their social networking service, MySpace, shown in Figure 7. They track customers’ behavior on a regular basis, which profits the company through understanding and analyzing online usage. Feedback forms can sometimes be intrusive and are less engaging than a forum that allows instant feedback from customers to which a company can respond online. Allowing customers to interact with each other on a Web site clearly facilitates natural observation. This is the best way to get to know what customers really think about a brand. Nike provides an online forum, shown in Figure 8, that results in a constant flow of interaction that helps the brand gather and understand their customers’ direct feedback. Feedback forms can sometimes be intrusive and are less engaging than a forum that allows instant feedback from customers to which a company can respond online. Show me the money! Trying to entice customers to complete a survey without offering them a reward is usually futile. People need to know they will get something from it, and offering a monetary reward is especially effective. 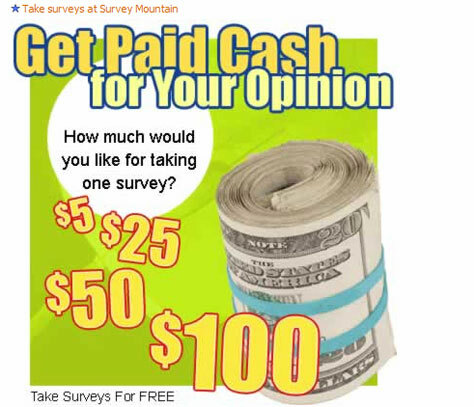 Figure 9 shows how Survey Mountain uses this strategy to reach their customers. People do not appreciate it when companies interrupt their task flows. Avoid attempting to gather personal information when customers or prospects are trying to get something done. It is important to avoid attempting to gather personal information when customers or prospects are trying to get something done. The example Web site in Figure 10 asks for detailed information they should not be asking for in a registration form. Asking for so much detail in the midst of a long task can be irritating. The last thing a Web site should do is to display a popup survey just as prospects and customers enter the Web site. The last thing a Web site should do is to display a popup survey just as prospects and customers enter the Web site. Customers enter a site to have a look at what a brand is offering—to find information that sells them something. 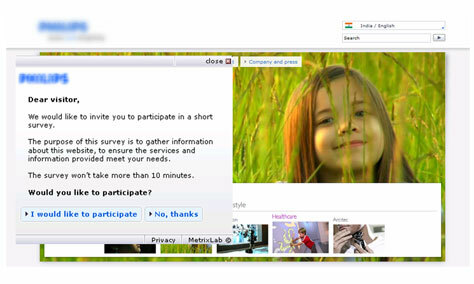 The kind of popup survey shown in the example in Figure 11 is clearly unadvisable. A passive form of feedback like a feedback form is the weakest approach a brand can take to collecting information. Like most Web sites, the Web site shown in Figure 12 asks customers for feedback via a link in its footer. A passive form of feedback like a feedback form is the weakest approach a brand can take to collecting information. Instead, a better approach would be to ask customers for their feedback through some interactive means like a quiz. Always provide an interactive context. For a feedback form, the context is passive. Customers are unlikely to click a link that does not entice them to click it. Gathering information in subtle and seductive ways provides a positive path forward. Most Web sites today find the need to do both marketing and customer research online. Unfortunately, some companies think, “So, let’s save some money. We can use our Web pages both to gather customer information and market our products and services online! Why not? It’s a win-win situation here.” Well, they’re wrong. Gathering information in subtle and seductive ways provides a positive path forward. Forcing prospects and customers to give you information only makes them inefficient in completing the tasks they’ve set out to accomplish. It slows them down and makes them resentful. Brands are finding out how important it is to keep customer research going through this online medium. behavioral—When gathering information, you can also capture the online behavior of prospects and customers. Targeting behavioral trends is the key here. demographic—Customer research and demography are the keys to every successful customer relationship. Helping customers get what they want based on their demographic profiles helps companies get to know them better. emotional—This is the most important trend when it comes to grabbing the attention of prospects. To transform a prospect into a loyal customer, meet their emotional needs and keep your business and its revenues rolling. The cycle shown in Figure 13 reflects every step of customer satisfaction. With the right approach, a brand can build trust, which in turn brings sustenance and joy. I want thank my entire MindTree family for spending their time in helping me get this article out. Thank you, guys! BC3 Strategies. “Experiential Branding: An Introduction.” Whitepaper, 2006. Retrieved on August 3, 2008. Lazzaro, Nicole. “Why We Play Games: Four Keys to More Emotion Without Story.” XEODesign, Inc., 2004. Retrieved on August 3, 2008. Wright, Kevin B. “Researching Internet-Based Populations: Advantages and Disadvantages of Online Survey Research, Online Questionnaire Authoring Software Packages, and Web Survey Services.” Journal of Computer-Mediated Communication, 2005. Retrieved on August 3, 2008. Thanks. This has been quite informative and useful. I’m glad that this was of help to you, John. Interesting thoughts. I was reading another article where corporate blogs are being used to get this feedback in a more informal way. I’m sure that this happens all around, Vishwa. Corporate blogs act as a research tool for marketing as well as gathering content online. This seems to be useful, because people from various backgrounds—both senior and junior—contribute. Another advantage is that the level of feedback and interaction is high with such tools.